I’m very excited to announce that SugarSocial has its very own, dedicated spot on the web: sugarsocialbeauty.com. This entire blog has been moved to the new site; all the archives are there and searchable, and everything you’ve read here can be accessed on the new site. In short, it’s all there, but better! Also, we’re still working out the kinks on the new site and trying to get it looking absolutely perfect. We’ve undergone a slight redesign, but we’ve kept the bones of the site intact. The look may change slightly over the next few days, so please bear with us. If you can’t find what you’re looking for, feel free to email me with questions. Looking forward to seeing you on the new SugarSocial! 2. Madewell Sidewalk Skimmer in Hematite Glitter (orig. $118; now $94.50) will give her a little spring in her step. 3. Veuve Clicquot Champagne (approx. $75) just screams celebration. Pop the cork and let the fun begin. 4. West Elm Labeled Kitchen Mixing Bowl Set ($59) has clean lines and modern type, and will be helpful to almost any cook. 5. C Wonder Initial Jewelry Box ($78): This slim lacquer box will store her most precious baubles. 6. Big Horn Pyrite Necklace ($88) is a sleek, edgy piece infused with a hint of sparkle. 7. Dyptique Figuier Candle ($60): A quintessential gift for the home, for your sister, hostess, or anyone else who appreciates fine candles. 8. Ole Henriksen Celebrate the Truth Kit ($60): Henriksen’s skincare products are seriously powerful, and this kit assembles the cream of the crop. You get deluxe-mini versions of Truth Creme Advanced Hydration, Truth Serum Collagen Booster, Truth Is In The Eyes Eye Peel Concentrate, & Truth To Go Wipes tucked in an (Hermes-like) orange travel bag. Combined, these products equal seriously restorative skincare that takes years off of the face. Since there seems to be so much to do and so many places to go this time of year, I thought I’d pull together a few guidelines for what to wear throughout the rest of the season. I’ve compiled a few outfit ideas (some items are certainly dream items, due to cost) for different occasions. Use this as inspiration to craft your perfect ensemble for wherever December takes you. To start, I have two takes on what to wear to a holiday party or on New Year’s Eve. One is for the girl who prefers silver, the other is gold–but of course, both involve sequins. The accessories are switched up to coordinate with the dress color, but the basics remain the same in both outfits. Look #1 (in silver tones): 1. Diane von Furstenberg “New Cindy” Sequin Dress ($625) 2. Madewell Colorblock Sequin Dress ($198) 3. Hue Opaque Control-Top Tights ($13.50) 4. Stella & Dot “Petra” Fringe Earrings ($59) 5. Alexis Bittar Modular Gold Small IMI Tourmaline Pebble Bracelet ($295) 6. Steve Madden “Galoree” Booties ($70) 7. Alexis Bittar “Allegory Skinny Smoky Dust” Bracelet ($155) 8. Oversize Black Snakeskin-Embossed Evening Clutch (Etsy, $58). Look #2 (in gold tones): 1. French Connection “Moonray” Sequin Dress ($268) 2. Gold sequin dress (Saw this on Pinterest & don’t know where this is from. Use it for inspiration!) 3. Hue Opaque Control-Top Tights ($13.50) 4. Kate Spade Clear Statement Earrings ($98) 5. Topshop Mixed Spike Rings ($25) 6. Concrete Polish Gold Pineapple Cluster Ring ($160) 7. Serpui Marie “Divine” Clutch ($189). 8. Vince Camuto “Ritz Suede” Pumps ($95). If you’re heading out on Christmas Eve, it’s the perfect time to get a little gussied up. If you’re staying in for a low-key gathering with food and/or cocktails, here’s an option for keeping it more casual. REFINED: 1. Alice + Olivia “Amanda” Long-Sleeve Peplum Dress ($330) 2. Belle Noel “Wishbone” Long Necklace ($60) 3. Kelsi Dagger “Lillian” Curved Suede Pump in Navy ($79) 4. Tory Burch Printed Canvas Small Shoulder Bag ($465) CASUAL: 5. Banana Republic Cable-Knit Cowl Sweaterdress ($79.50) 5. J.Crew Classic Link Bracelet ($88) 6. Hue Opaque Control Top Tights in Espresso ($11) 7. Banana Republic “Sierra” Zip Bootie ($198). There are more outfit options after the break! With Repstyle, Essie debuts a new magnetic nailpolish formula. You’ve probably seen magnetic polishes before (they hit the market within the past 6 months or so via mass market brands like Sally Hansen), but this is Essie’s first foray into the magnetic realm. There is a magnet on the top of the cap that creates a pattern in the polish.The collection is called Repstyle because the magnet creates a snakeskin-like print on the nails (a stylish take on a reptilian print). I think it looks more like a fishnet pattern, but whatever. Here’s how it works: paint your nails with one coat of the magnetic nailpolish and let it dry. Then, paint one nail with another coat and hold the magnet over the nail, getting it as close to the surface of the nail without actually touching it. Hold it there for 5-10 seconds before moving it away from the nail. You’ll see the snakeskin pattern on your nails at this point. Repeat the process on each nail. The formula is slightly modified from Essie’s standard polishes (because of its magnetic properties) but you won’t notice much, if any, difference. It applies the same, has the same consistency (and will thicken in the bottle over time), and dries in about the same amount of time. It gives nails a nice texture without being too obvious that you’re wearing nail art or a pattern. You’ll notice the pattern more in the lighter shades, like Repstyle and Lil Boa Peep, and it will be subtler in the darker shades. Will you be giving these new polishes a try? Benefit’s new product, Fine One One ($30) will make your cheeks drop-dead gorgeous. The push-up cream stick contains three bars of color: coral, lush pink, and a skinnier champagne pink strip. Here’s how it works: push the stick up, center it on the apple (the fattest part) of your cheek near your nose with the pale pink strip facing up, and drag it toward your temple. The three shades work together to contour, highlight, and give your cheeks a pop of color. The coral is the darkest shade, and sweeps into the hollow of your cheek, creating a contour. The pink glides right on your cheekbone, giving you a lovely flush of color. Finally, the champagne pink sits right above the cheekbone, creating a pretty, shimmery highlight. Blend, and you’re good to go (the cream-to-powder formula makes this step super easy and quick). Sculpted, flushed cheeks in about two seconds. When it comes to giving gifts, beauty products are particularly tough to buy. Picking something out for someone else is just so hard, even if the person is your sister. When you want to get your sister, friend, or relative something beauty-related but have no idea where to start, the beauty kits that flood the stores this time of year are awesome. For the beauty maven who seems to have it all, a gift set is a great way to let her experiment with new products, or stock up on favorites. Go for a brand she’s never tried before, or zero in on her favorite, and you’ll have gift-giving all wrapped up this holiday season. Here are a look at a few of my favorites. 16 eyeshadows (Satin Sheets, Marshmallow, Peach Fuzz, Buff, Malted Milk Ball, Lovey Dovey, Copper Peony, Gum Drop, Teddy Bear, Honeymoon, Cherry Cola, Cop a Teal, Nice Stems, Nice Ash, Pastille, & Black Sugar). Check out more gift-worthy sets after the break. Foxy makes a repeat appearance here; it is included in the Naked 2 palette. Faint is very similar to Naked and Buck from the Naked palette. Crave is also a dupe of Blackout from Naked 2, and is a matte version of the shimmery Creep shade from Naked. Overall, this doesn’t strike me as a revolutionary product like its predecessors. 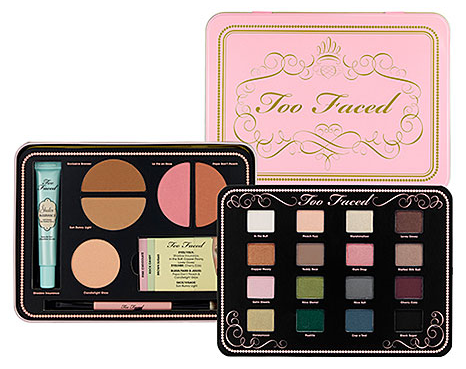 Its shades are similar to ones that are already part of the other larger palettes. This seems to me like a way for UD to get you to drop some cash on a new palette in the holiday shopping rush. Bottom line: Stick with Naked and/or Naked 2. They give you more bang for your buck, have a wider variety of amazing, pigmented shades, and are far more interesting. Welcome to the latest installment in this year’s series of holiday gift guides. This time I’m focused on great gifts under $50. Have a favorite? Share it in the comments! 1. Kate Spade Lip Crayon Box Set ($38): Just the cutest thing any chic girl would ever want to carry around in her purse. 2. Anthropologie Celestial Coaster Set ($32 for set of four, various colors): These natural coasters look like little gems scattered across a table. 3. J.Crew Pearls and Petals Necklace ($45): The glinty crystals and punchy orange stones on this piece are bright enough to chase away the winter doldrums. 4. FASHION: 150 Years of Couturiers, Designers, and Labels ($38): This classic book covers the basics from renowned couture designers and labels. 5. Lilly Pulitzer Carded ID Wristlet ($38, shown here in the Shorely Blue A Little Leg Mini print): Does your best friend/sister/cousin hate lugging an oversized bag around for a night on the town? This little wristlet fits the essentials without weighing her down: iPhone, lip gloss, ID cards, cash, a few keys, and spare change. 6. The Scent of Departure Eau de Parfum: New York ($45): Possibly the perfect little gift for any lady whose heart holds a special place for the Big Apple. It’s the scents of the city (the pleasant ones), all bottled up and ready for a whiff. Especially great for ex-New Yorkers or those who live far away from the city. 7. J.Crew Printed Makeup Pouch ($25): The feminine bow print makes this cosmetic bag the perfect vessel for stowing and toting makeup. 9. Essie’s winter ’12 Leading Lady collection (all 6 polishes=$48): Give her the gift of hundreds of colorful manis with these holiday shades that are matte, shimmery, and full-on glittery. There’s a gadget freak on everyone’s list…here are some things they will love. 1. Gizmon iCA Black iPhone 4/4S Case ($55): Doesn’t do anything to enhance the iPhone’s camera, but the recipient will look & feel cool snapping pics with this vintage-inspired case on his/her phone. 2. PowerMate Plus for J.Crew Backup iPhone Battery ($39.50): Because who hasn’t been stuck with a dying phone? Comes in super cute colors and patterns. 3. Crosley Revolution Turntable ($150) allows vinyl collectors to take their records on the road (it’s compact & battery-operated), & also provides a cool table centerpiece. 4. Kindle Fire HD ($199-$249): Read books and magazines, surf the web, utilize apps, play games…the options on this tablet are virtually endless. Especially great for commuters, kids, students…pretty much everyone. 5. VuPoint Photo Cube ($160): Stick your iPhone in the dock and it spits out quality prints right from your phone. 6. Sirius Satellite Radio with Vehicle Kit ($50): If the recipient spends any time in the car, he/she will be so glad to have this, especially on road trips. Even though we haven’t officially gotten to winter yet, let’s talk spring! I wanted to show you these polishes because they are so bright, peppy, and spring-like. I’m already dreaming of warm weather, blooming flowers, and chirping birds. 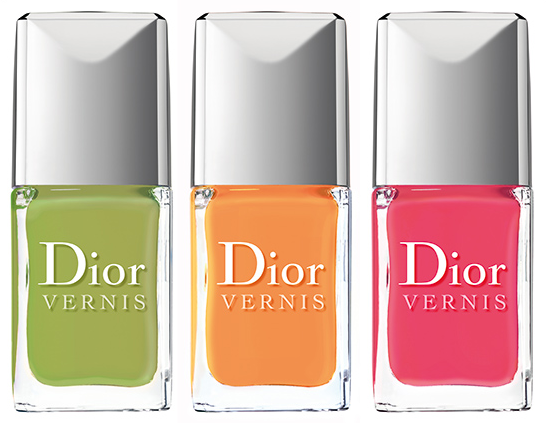 Dior’s Vernis Cruise Collection includes three vivid shades: Lime (spring green), Pasteque (watermelon pink), and Mango (warm yellow). Keep these in mind for when winter starts to thaw. If you are a company and you'd like to see your products on SugarSocial, please contact me at sugarsocial [at] gmail [dot] com.